It’s quite the compliment to be immortalised in art, however Eamonn Holmes couldn’t quite hold back the giggles when he saw one artist’s interpretation of his face! 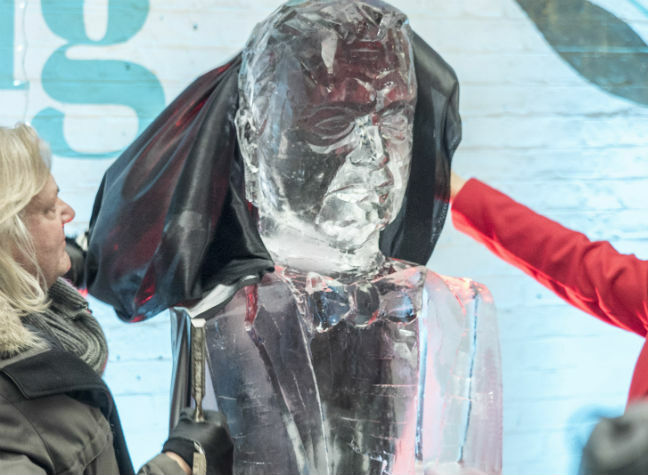 On yesterday’s This Morning, Eamonn unveiled an ice sculpture of his head made by ice artist Phillip Hughes. 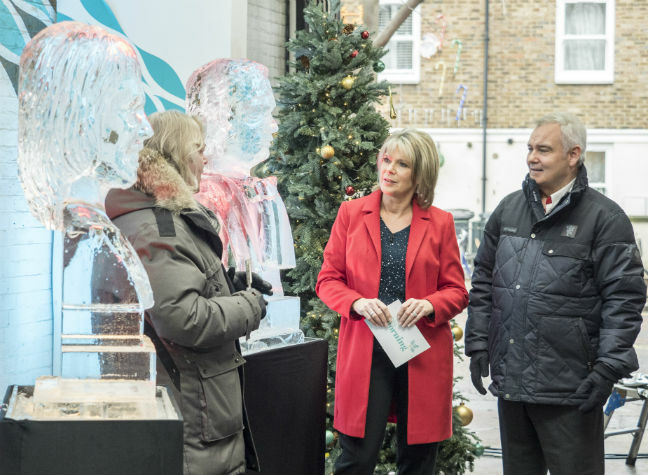 With his co-host and wife Ruth Langsford, Eamonn didn’t seem to mind the freezing temperature, but was less certain about the sculpture’s frozen features. It’s safe to say that it wasn’t quite what Eamonn was expecting, with the 58-year-old presenter commenting that the bust looked more like Casino Royale actor Daniel Craig with a bow tie. “Oh yes, with a bow tie! It’s Daniel Craig, you’ve got the cheeks just right” he said while tryihg to stifle laughter, but still called the work “stupendous”. Ruth mentioned that Phillip Hughes was given only a few hours before the show to make his icy creations, but the artist revealed that sometimes it takes him days to finish an ice sculpture. Before the unveiling, Ruth and Eamonn had a light-hearted tiff during the show aafter Eamonn revealed a crush on former-Countdown presenter Carol Vorderman. Updating viewers about their attempt to make ‘Last Christmas’ by Wham! this year’s Christmas number one in memory of the late George Michael, Eamonn admitted, “It’s one of the lovely songs at Christmas. I like a carol myself’. Ruth agreed, saying, “I love carols”, as Eamonn quickly said, “Carol Vorderman” before hastily changing the subject. Ruth got her own back, as later on the show the artist Phillip Hughes began carving more ice sculptures. We can’t say we see the likeness to Eamonn or Daniel Craig, but the sculptures are nonetheless impressive!